Here we display our entire range of window furnishing accessories which are grouped together in their relevant categories to help you find exactly what you’re looking for quickly and easily. We include every type of accessory needed for hanging curtains onto a track as well as extra fixings and fittings to install certain products to a wall or ceiling. This category includes all types of gliders which coordinate with our range as well as brackets, stop ends, hooks for heading tape and cording kits for upgrading hand operated to corded systems. 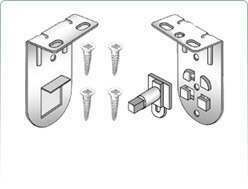 This page shows all types of wooden and metal brackets as well as all end, centre, passing, ceiling fixing, recess brackets and corner joints for creating bay windows and returns. We supply holdbacks and extra rings for our collection of poles including metal and wooden for all diameters as well as passing rings for bay windows. We sell lengths of pole only enabling you to customise your window dressing without purchasing a complete set as well as various styles of hooks for attaching drapes onto a pole or track. Decorative finials are available and draw rods are ideal for aiding the operation of your drapes without having to pull the fabric by hand. 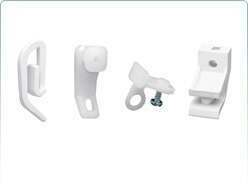 The accessories for blinds are spares and extras for the range of ready made and made to measure products we supply, these include brackets, control chains, cord safety devices for children and all hangers and weights for verticals. 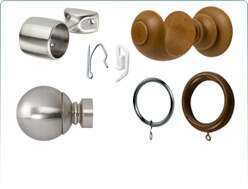 These include plastic, metal and nylon hooks for attaching and operating curtains on a pole or track. We also display our selection of draw rods for opening and closing drapes without having to handle fabrics by hand. Tiebacks are a decorative and practical means of securing the curtains away from the window, allowing more sunlight into the room during the day. If you are having trouble finding what you’re looking for then please contact us on 0845 465 0101 and a member of our team will be happy to help.